You can adapt this pattern for any project. With regularly spaced increases, you will get a polygon with the same number of sides as increases. If you space the increases more randomly, your results will look like a circle, no matter how many increases are needed. 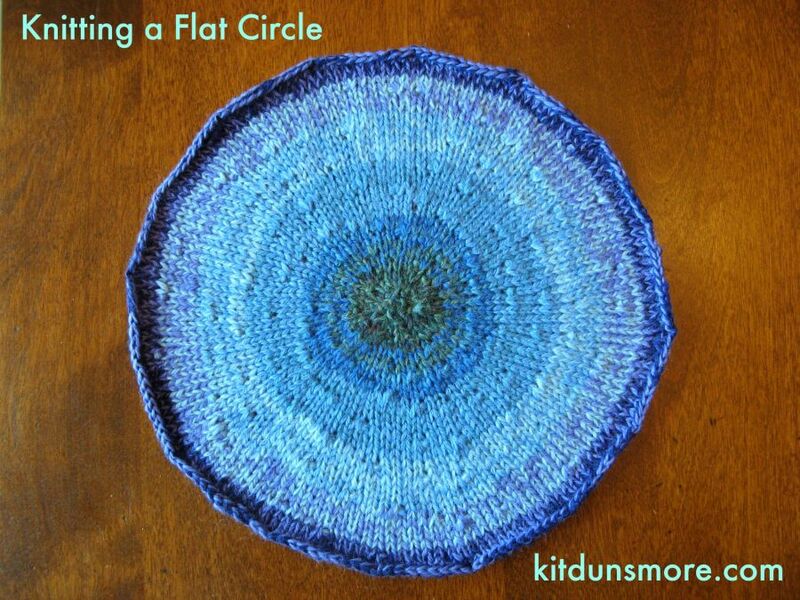 Here’s the pattern that results from using geometry to figure out how to knit a flat circle. I’ve included instructions for circles and polygons, so you can try it both ways. Knit a gauge swatch* using the yarn and needles you want to use for your circle. Measure the height (h) and width (w ) of your stitch. Cast N stitches onto double-pointed needles and join in the round. Row 1: Kfb N times, placing a marker between every two stitches to mark sections. Row 2: *Kfb k2 Kfb* repeat * to * until you run out of stitches. The number of increases per row is fixed (N), but the number of total stitches increases every row. The number of knit stitches between increases is one less than the row number, but you don’t have to count rows. You can see the increase stitches in the previous row and just Kfb into them, knitting everything else. *Yes, you have to. Without knowing your gauge, none of this works. hey! This is great. I have a similar pattern for knitting hexagons but outside-in. Have a look on my blog at the ‘tortoise and the sheep’ pattern – it’s a blanket where you attach hexagons onto one another as you knit but the principle is the same as what you’re doing, sort of! I checked out your post and pattern and I love it! One of my favorite things about knitting is its versatility, that you can knit bottom up or top down, inside-out or outside-in. I also like your idea of picking up stitches so you don’t have to seam everything together later. Looking forward to seeing how your blanket turns out! Hi! Random, I know, but I love your knitting and I nominated you for one of those Liebster blogging awards! If you’re interested: https://tangerinewallpaper.wordpress.com/2015/09/16/i-really-really-miss-those-myspace-bulletins/ 🙂 Have a great day! Thank you so much! I have a project in mind and this will be sooooooo useful! I have a question though – what measurements do you use for your stitch? Say my stitch is .75 inches high – do you use .75 as the measurement? Or is it in cm? Thanks so much! I did it in inches. All that matters is that you use the same units for your stitch height and your gauge measurement. You can do inches and stitches/inch, or cm and stitches/cm. Both will work. Good luck and I would love to see what you make! Hi kit, I have few questions,say I wanna make a 34 cm diameter round (h/w=68cm) since it’s a circle the width and height is the same and how counting( 2π(x)h)/w makes any diff with just 2pi. And I’m still confuse as how to put how many kfb on 2nd and the following rounds.how much should I kfb and knit.Thankyou for reading and have a nice day! The height and width measures are relative to the stitches in your sample swatch, and have nothing to do with the size of your circle. H = how tall a single knit stitch is and w = how wide a single knit stitch is. For a 34 cm diameter circle, the number of rows you need will equal 34/the height of one stitch (with is how tall your row is). The number of kfb’s is always the same: it equals N (the number of stitches you calculate with the formula and cast on. So the second row, kfb in every stitch. The third row, kfb every other stitch. As you get further and further in, you have only one kfb per “section” (see the note about placing markers while knitting the 2nd row). I forgot to mention.There are 30 sts for casting 6.28cm into the needle size 5.5. I am not sure what you are trying to tell me here. Is this your gauge? Hi, sorry to confuse you, I misunderstood your explanation before, I’m okay now! Glad it makes sense now. Have fun knitting! Thank you so much! It is being used to design a non-pointy hat, because, while our heads do not taper off to a point, somehow my hats always do! You’re welcome! That’s a great use for this pattern. I have a small question – is it possible to do this with m1 increases instead of kfb? Do you think it would work? If so should I use paired increases (m1L and m1R) and how? I never thought about trying other kinds of increases. I think at the time kfb was just my go to increase. I don’t see why other increases wouldn’t work, but I will have to try it to give you an answer about pairing them… I will try this in the next few days and get back to you! Thanks for asking and for visiting my blog. Thanks so much for replying. I don’t really know much about knitting ‘theory’ so I think your trial would be very helpful! Since I read somewhere that m1 increases are the most invisible increases, I thought it would help the circle look more even as we are making a lot of increases. That’s a really helpful article! Thanks for responding with so much dedication and enthusiasm. I’m glad you found it useful. Have fun knitting socks. There are lots of different methods out there. You just need a clearly written pattern and some courage.